What I really liked about The Devil You Know is the different angle. We often read books from the point of view of the killer, or the police who are investigating, and even the victims, but this book is about those people who live with someone they have suspicions about. We’ve all seen it on Crimewatch when they ask if someone you know is behaving strangely. And we’ve probably all remarked that somebody must know who did it. The story starts off with Juliet. She’s married to a violent man and is pretty much downtrodden. I liked her and kept thinking that if her husband was the Lyndford Strangler then at least she could be free of him. And I also particularly liked Dorothy, the mother of Orlando who is not going to his metal-detecting class even though he tells her he is. There are more thoroughly likeable characters in this book than there are unpleasant ones. This makes it a very easy book to enjoy. Each chapter is told from a different viewpoint as the Strangler keeps on killing and this kept up the momentum and the suspense really well. The writing has a very human aspect and certainly makes you wonder what you would do in similar circumstances. I felt for each and every one of the characters who suspected. Maisie is a lovely teenager looking out for her mum and Steve is a kind man with a misguided loyalty to his oldest friend. I was kept guessing all the way through. I just never knew who the culprit was going to turn out to be. It really could have been any of them and so in a way it wasn’t a great surprise when I found out. But there is a fab twist at the end which was totally unexpected and, without giving anything away, I thought it was the perfect way to deal with one of the characters. This is a fantastic psychological crime novel. I very much enjoyed Terry Tyler’s style of writing, her astute characterisations and the clever storyline. Thank you to Terry Tyler for the review copy. 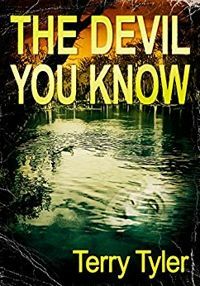 The ebook of The Devil You Know is available now. I’ve only read the last sentence so as not to be influenced as it’s also on my to review list. Glad to know you enjoyed though. Fair enough, it’s very good. Hope you enjoy it as much as I did. You’re very welcome, Terry. It’s a great read – not sure why that should be a surprise! Ah, sorry, perhaps I should have warned you I was posting it. I can imagine the heart in mouth feeling as you click on the link! No. Suspense is good for the psyche!